2 Teaching Grammar to Young Learners Can we teach grammar to Young Learners? The tutorial in brief. 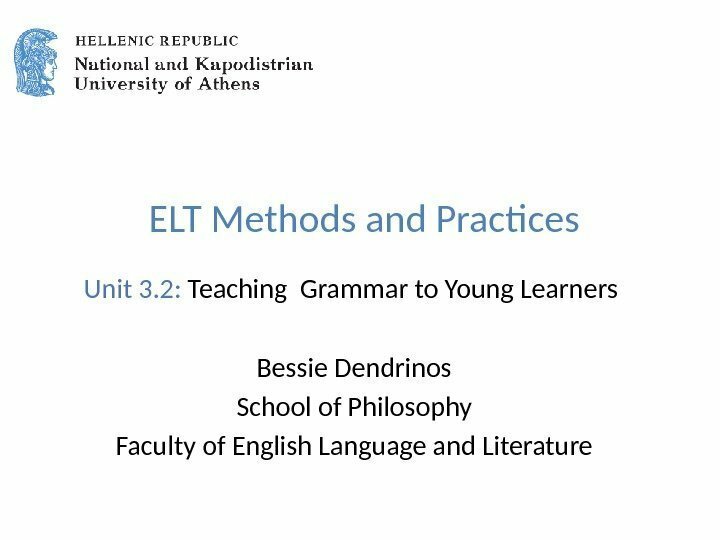 • Target group: EFL learners in Greek primary school: – very young learners (ages 6 -8), – young learners (8 -12). • Basic questions to answer: – What type of grammar should we teach to young learners? – should grammar be taught explicitly to both very young and young learners? – What type of activities are appropriate? 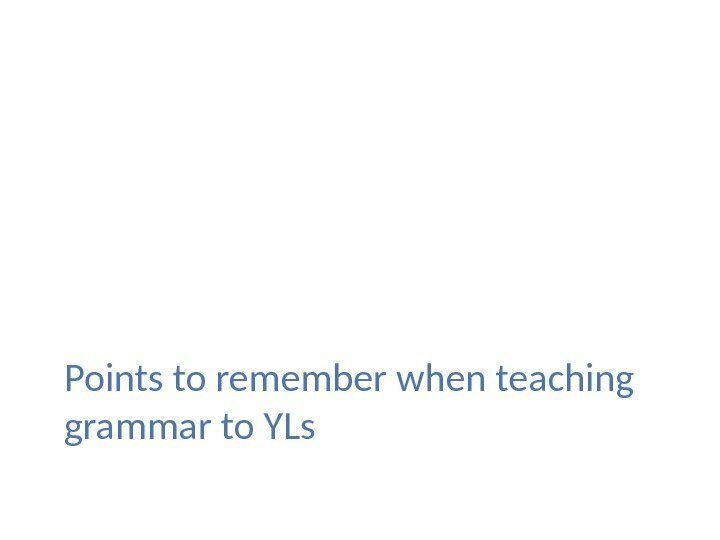 3 Teaching Grammar to Young Learners What ‘aspect’ of grammar? 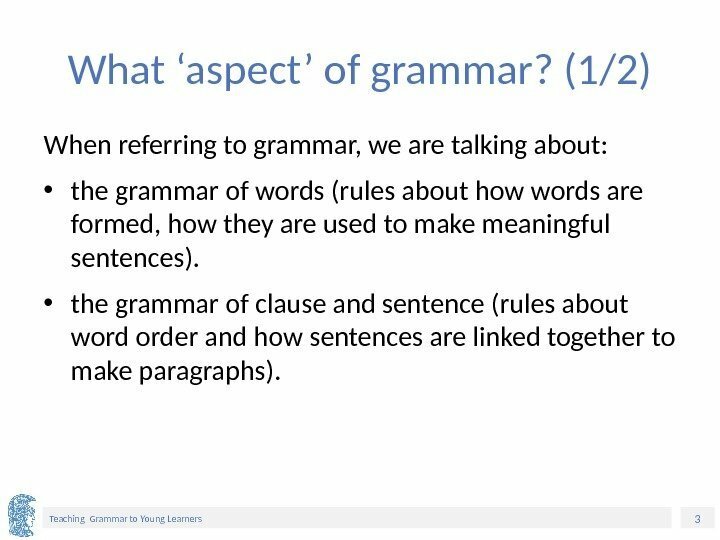 (1/2) When referring to grammar, we are talking about: • the grammar of words (rules about how words are formed, how they are used to make meaningful sentences). • the grammar of clause and sentence (rules about word order and how sentences are linked together to make paragraphs). 4 Teaching Grammar to Young Learners What ‘aspect’ of grammar? 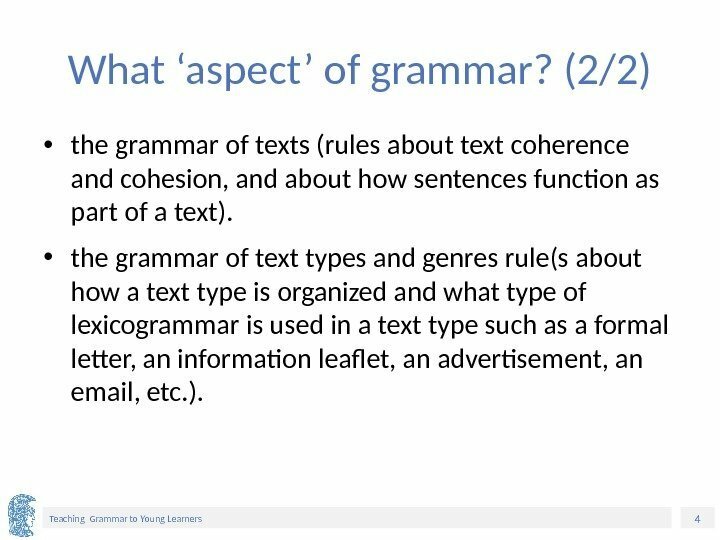 (2/2) • the grammar of texts (rules about text coherence and cohesion, and about how sentences function as part of a text). • the grammar of text types and genres rule(s about how a text type is organized and what type of lexicogrammar is used in a text type such as a formal letter, an information leaflet, an advertisement, an email, etc. ). 5 Teaching Grammar to Young Learners Do children learn differently from adults? 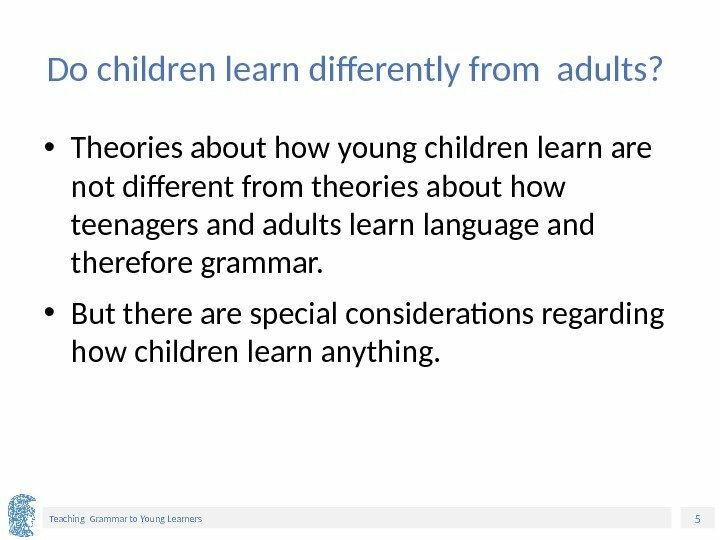 • Theories about how young children learn are not different from theories about how teenagers and adults learn language and therefore grammar. • But there are special considerations regarding how children learn anything. 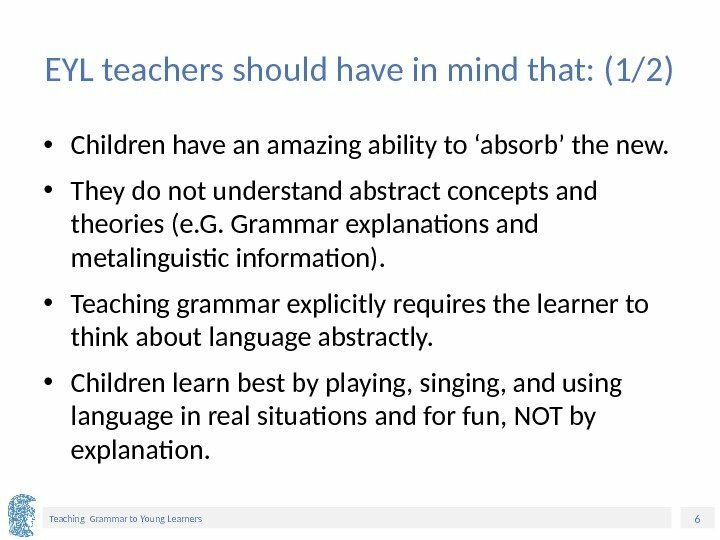 6 Teaching Grammar to Young Learners EYL teachers should have in mind that: (1/2) • Children have an amazing ability to ‘absorb’ the new. • They do not understand abstract concepts and theories (e. G. Grammar explanations and metalinguistic information). • Teaching grammar explicitly requires the learner to think about language abstractly. • Children learn best by playing, singing, and using language in real situations and for fun, NOT by explanation. 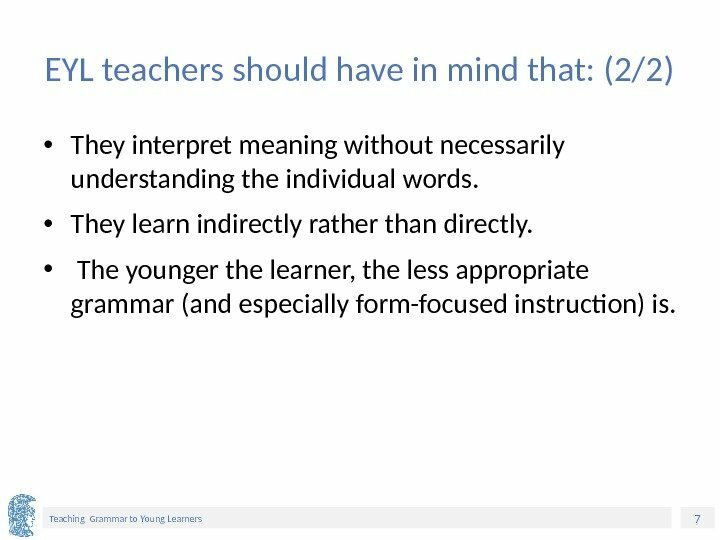 7 Teaching Grammar to Young Learners EYL teachers should have in mind that: (2/2) • They interpret meaning without necessarily understanding the individual words. • They learn indirectly rather than directly. • The younger the learner, the less appropriate grammar (and especially form-focused instruction) is. 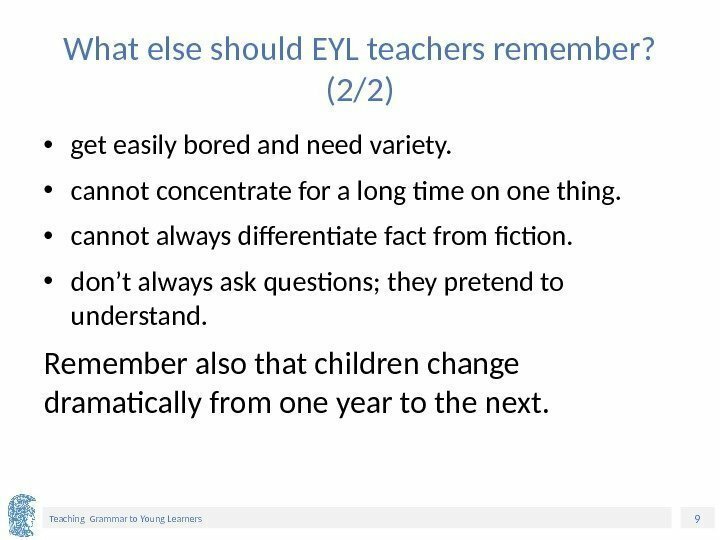 8 Teaching Grammar to Young Learners What else should EYL teachers remember? (1/2) Very young and young learners: • need to be praised or else they give up and don’t want to comply. • can use language before they understand clearly the meaning of what they are saying. • need to be absolutely sure of what to do. • learn through their eyes, ears, hands and their senses. 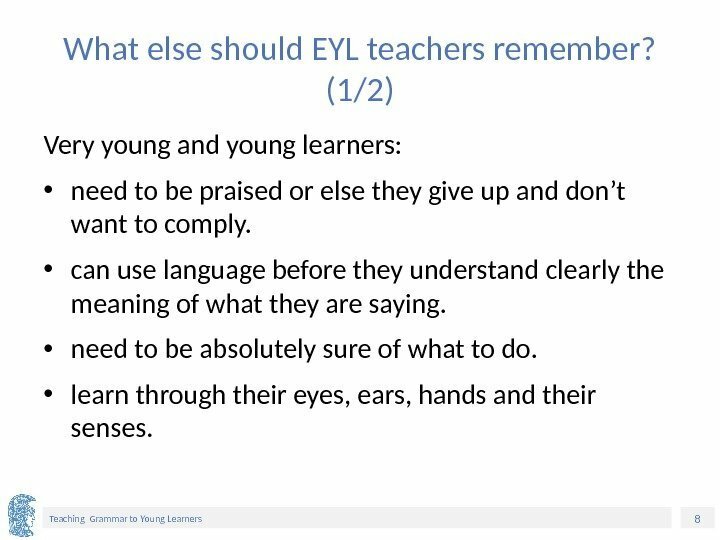 9 Teaching Grammar to Young Learners What else should EYL teachers remember? (2/2) • get easily bored and need variety. • cannot concentrate for a long time on one thing. • cannot always differentiate fact from fiction. • don’t always ask questions; they pretend to understand. Remember also that children change dramatically from one year to the next. 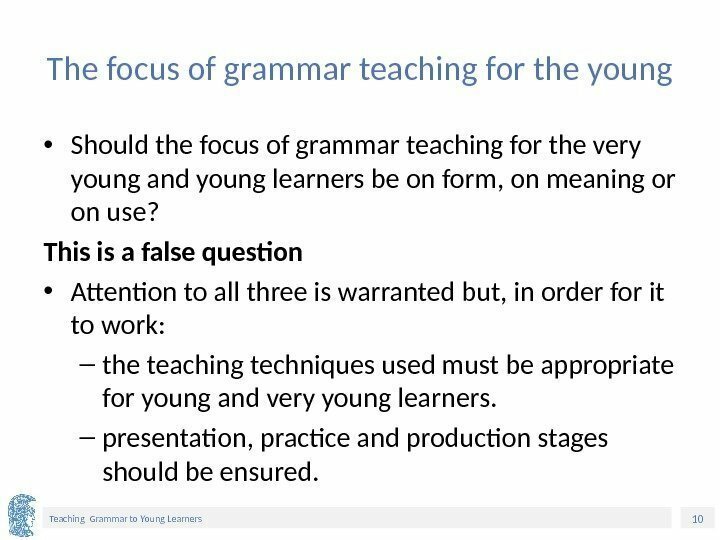 10 Teaching Grammar to Young Learners The focus of grammar teaching for the young • Should the focus of grammar teaching for the very young and young learners be on form, on meaning or on use? This is a false question • Attention to all three is warranted but, in order for it to work: – the teaching techniques used must be appropriate for young and very young learners. – presentation, practice and production stages should be ensured. 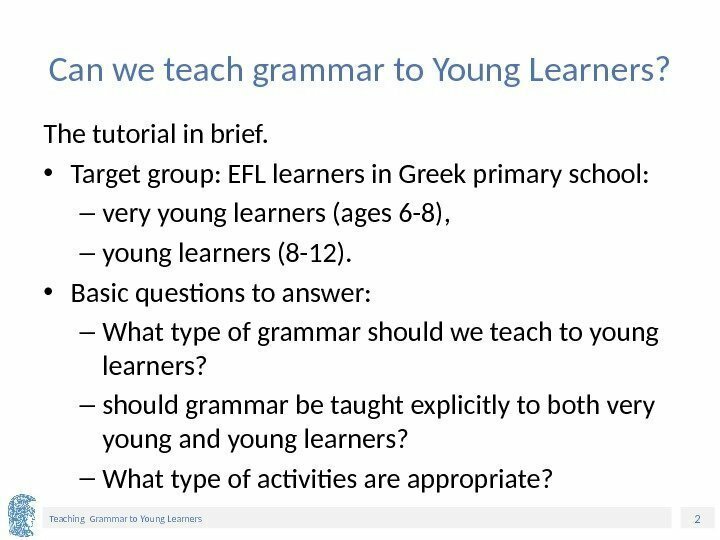 11 Teaching Grammar to Young Learners Is there an appropriate methodology for teaching grammar to YLs? 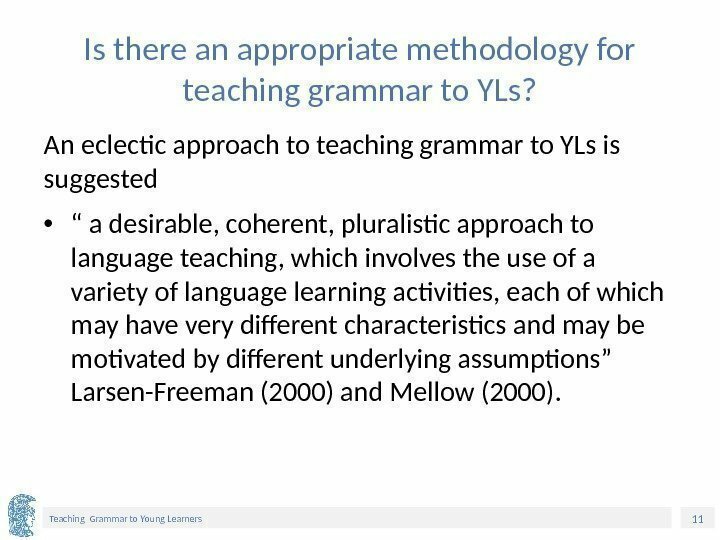 An eclectic approach to teaching grammar to YLs is suggested • “ a desirable, coherent, pluralistic approach to language teaching, which involves the use of a variety of language learning activities, each of which may have very different characteristics and may be motivated by different underlying assumptions” Larsen-Freeman (2000) and Mellow (2000). 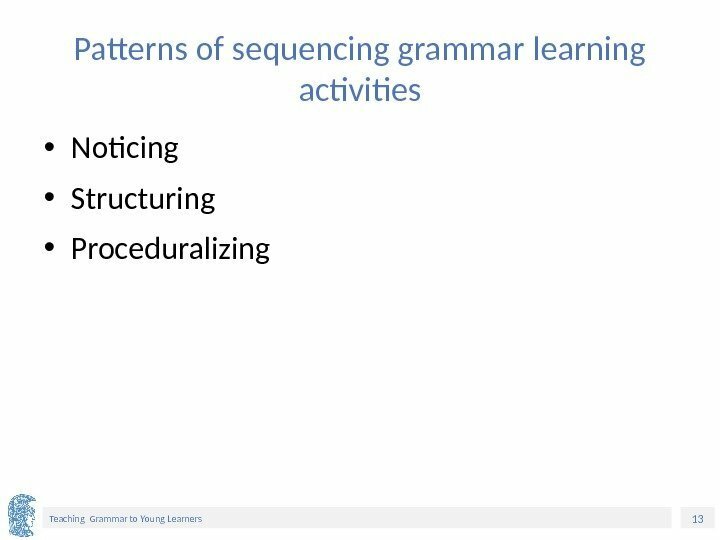 12 Teaching Grammar to Young Learners Through an ecclectic approach • Children’s varying learning styles are considered. • Meaningful communication is the main focus in language learning. • Grammar is seeing as an integral part of meaningful communication. 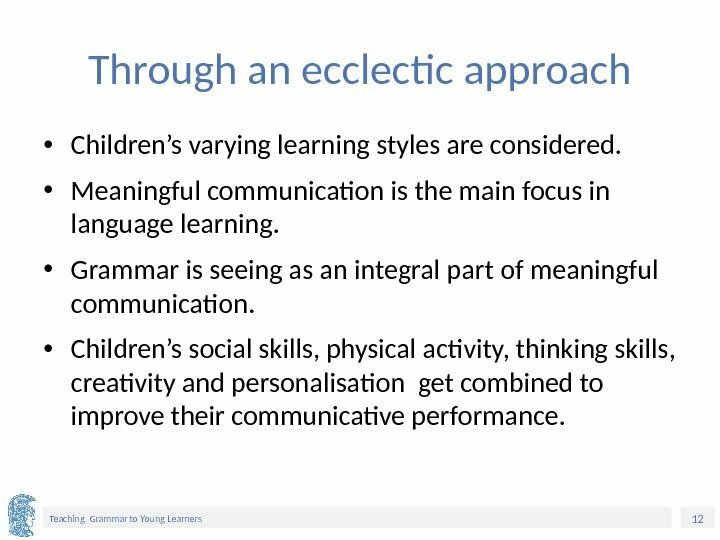 • Children’s social skills, physical activity, thinking skills, creativity and personalisation get combined to improve their communicative performance. 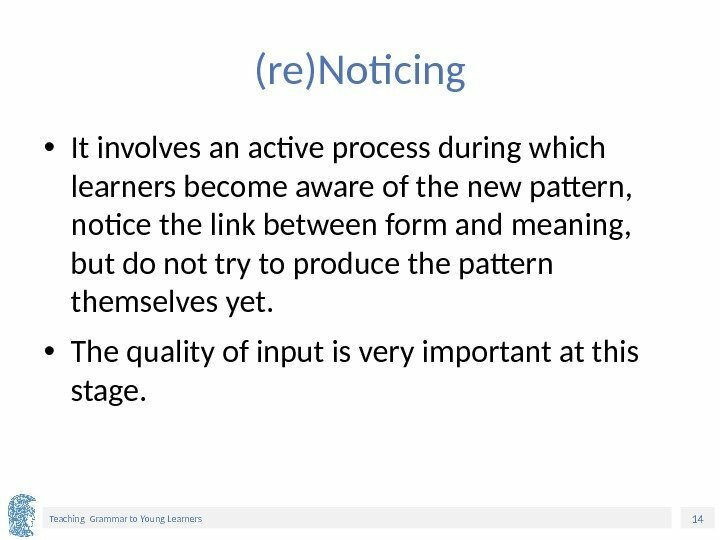 14 Teaching Grammar to Young Learners (re)Noticing • It involves an active process during which learners become aware of the new pattern, notice the link between form and meaning, but do not try to produce the pattern themselves yet. • The quality of input is very important at this stage. 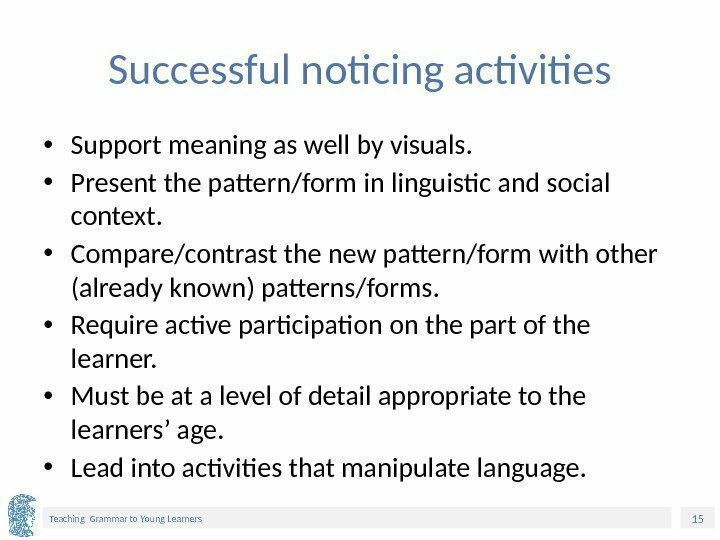 15 Teaching Grammar to Young Learners Successful noticing activities • Support meaning as well by visuals. • Present the pattern/form in linguistic and social context. • Compare/contrast the new pattern/form with other (already known) patterns/forms. • Require active participation on the part of the learner. • Must be at a level of detail appropriate to the learners’ age. • Lead into activities that manipulate language. 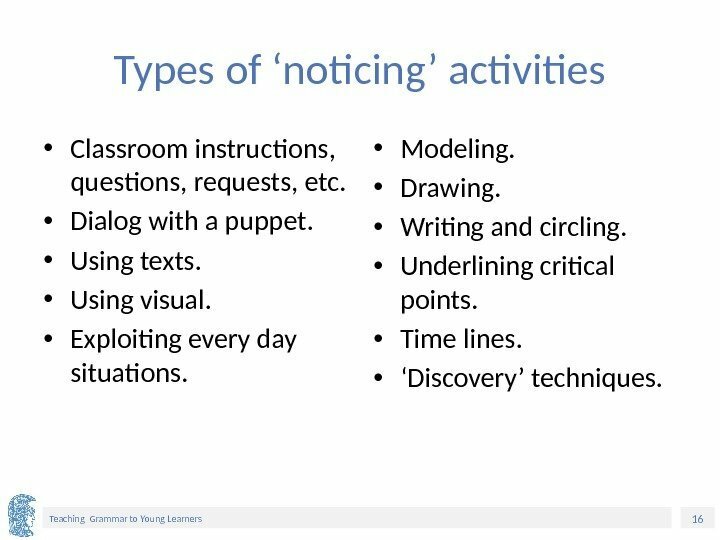 16 Teaching Grammar to Young Learners Types of ‘noticing’ activities • Classroom instructions, questions, requests, etc. • Dialog with a puppet. • Using texts. • Using visual. • Exploiting every day situations. • Modeling. • Drawing. • Writing and circling. • Underlining critical points. • Time lines. • ‘ Discovery’ techniques. 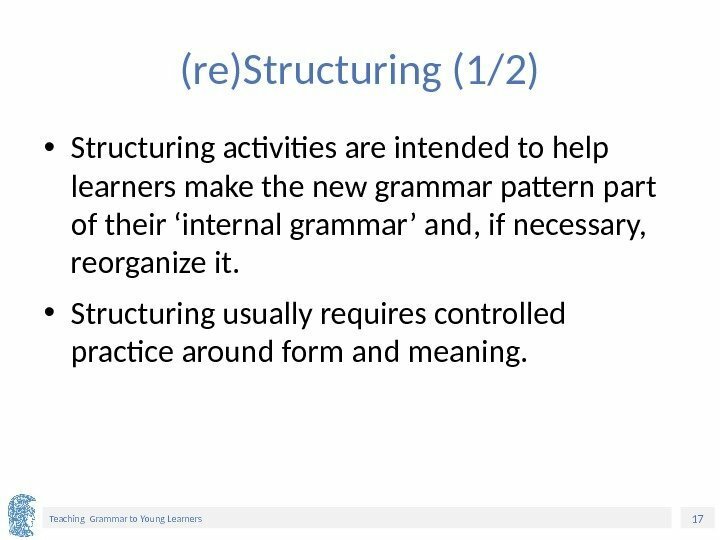 17 Teaching Grammar to Young Learners (re)Structuring (1/2) • Structuring activities are intended to help learners make the new grammar pattern part of their ‘internal grammar’ and, if necessary, reorganize it. • Structuring usually requires controlled practice around form and meaning. 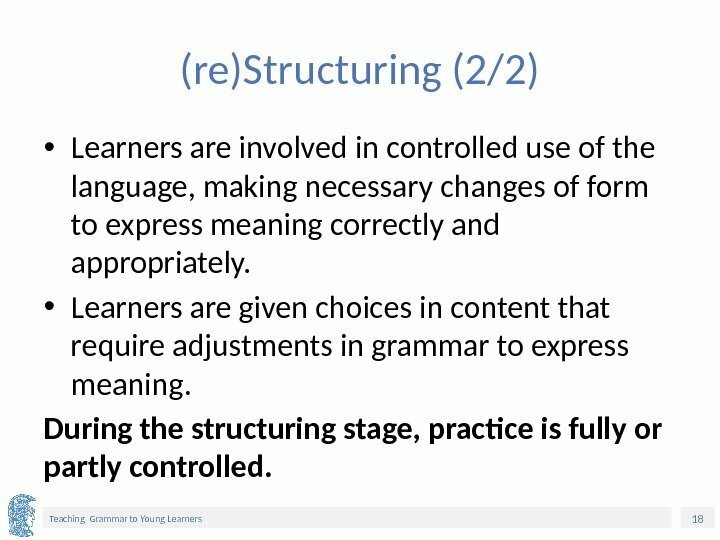 18 Teaching Grammar to Young Learners (re)Structuring (2/2) • Learners are involved in controlled use of the language, making necessary changes of form to express meaning correctly and appropriately. • Learners are given choices in content that require adjustments in grammar to express meaning. During the structuring stage, practice is fully or partly controlled. 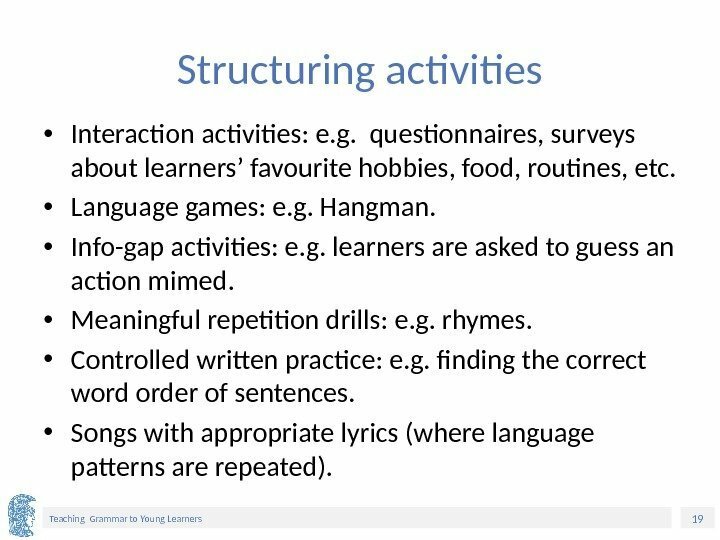 19 Teaching Grammar to Young Learners Structuring activities • Interaction activities: e. g. questionnaires, surveys about learners’ favourite hobbies, food, routines, etc. • Language games: e. g. Hangman. • Info-gap activities: e. g. learners are asked to guess an action mimed. • Meaningful repetition drills: e. g. rhymes. • Controlled written practice: e. g. finding the correct word order of sentences. • Songs with appropriate lyrics (where language patterns are repeated). 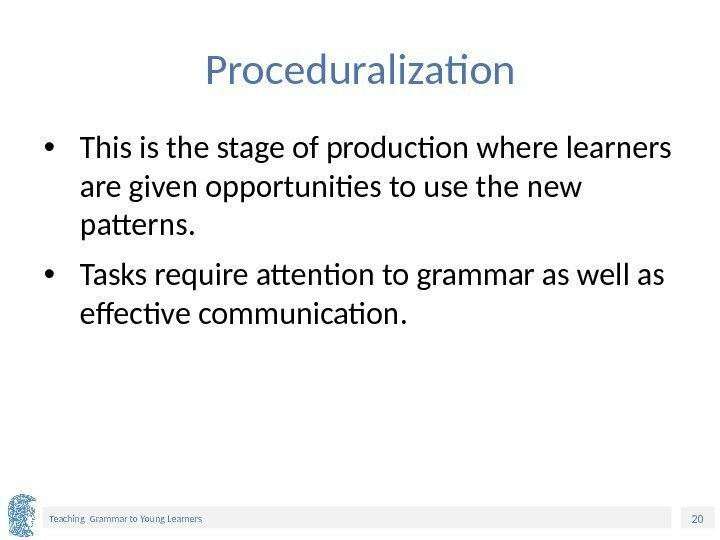 20 Teaching Grammar to Young Learners Proceduralization • This is the stage of production where learners are given opportunities to use the new patterns. • Tasks require attention to grammar as well as effective communication. 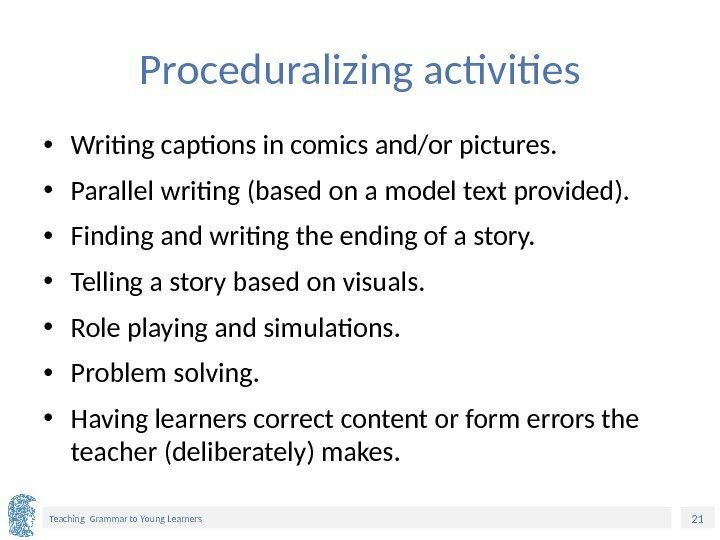 21 Teaching Grammar to Young Learners Proceduralizing activities • Writing captions in comics and/or pictures. • Parallel writing (based on a model text provided). • Finding and writing the ending of a story. • Telling a story based on visuals. • Role playing and simulations. • Problem solving. • Having learners correct content or form errors the teacher (deliberately) makes. 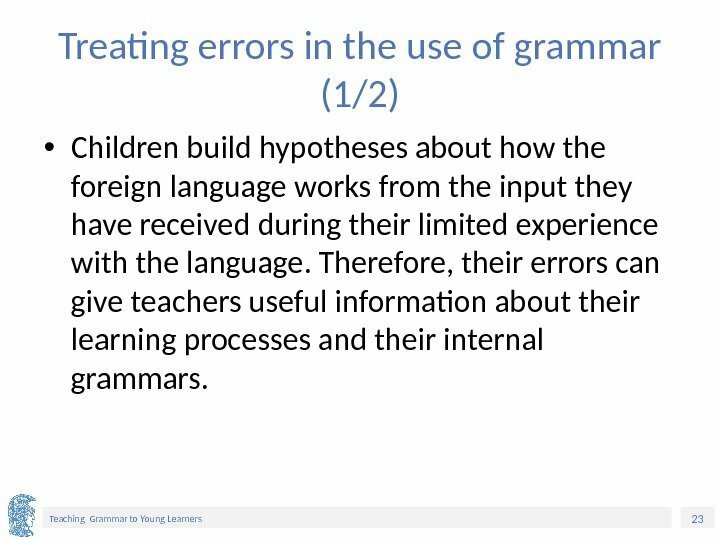 23 Teaching Grammar to Young Learners Treating errors in the use of grammar (1/2) • Children build hypotheses about how the foreign language works from the input they have received during their limited experience with the language. Therefore, their errors can give teachers useful information about their learning processes and their internal grammars. 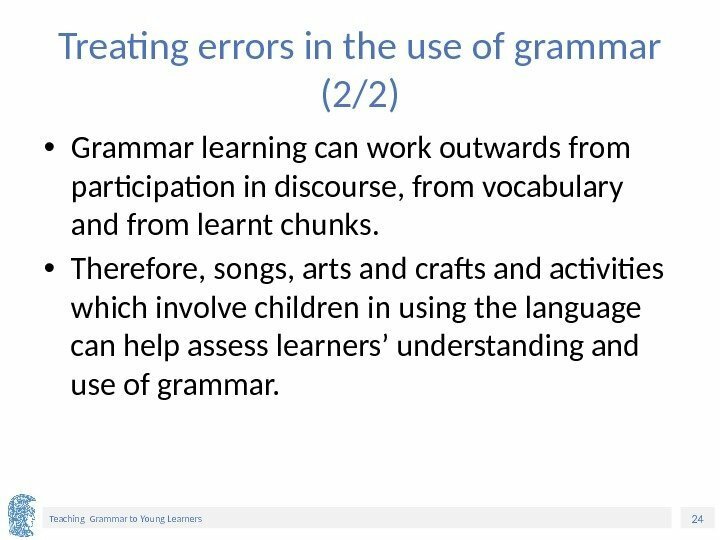 24 Teaching Grammar to Young Learners Treating errors in the use of grammar (2/2) • Grammar learning can work outwards from participation in discourse, from vocabulary and from learnt chunks. • Therefore, songs, arts and crafts and activities which involve children in using the language can help assess learners’ understanding and use of grammar. 25 Teaching Grammar to Young Learners The learner’s role • The learner is the one to do the learning. 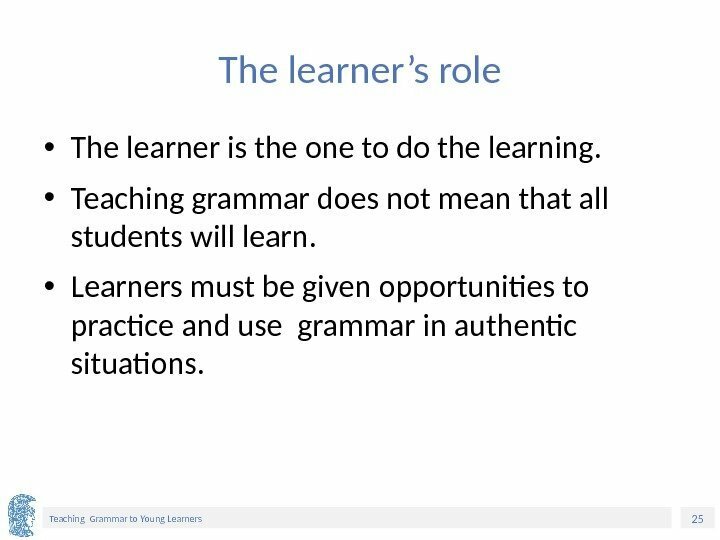 • Teaching grammar does not mean that all students will learn. • Learners must be given opportunities to practice and use grammar in authentic situations. 27 Teaching Grammar to Young Learners Financing • The present educational material has been developed as part of the educational work of the instructor. 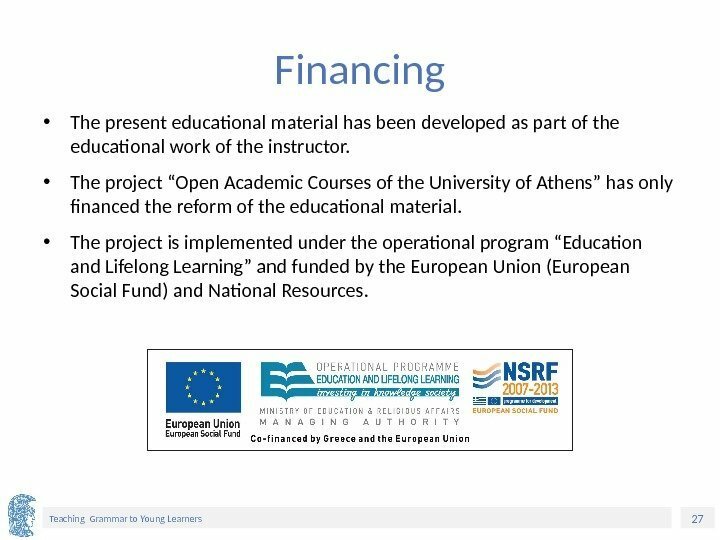 • The project “Open Academic Courses of the University of Athens” has only financed the reform of the educational material. • The project is implemented under the operational program “Education and Lifelong Learning” and funded by the European Union (European Social Fund) and National Resources. 29 Teaching Grammar to Young Learners Note on History of Published Version The present work is the edition 1. 0. 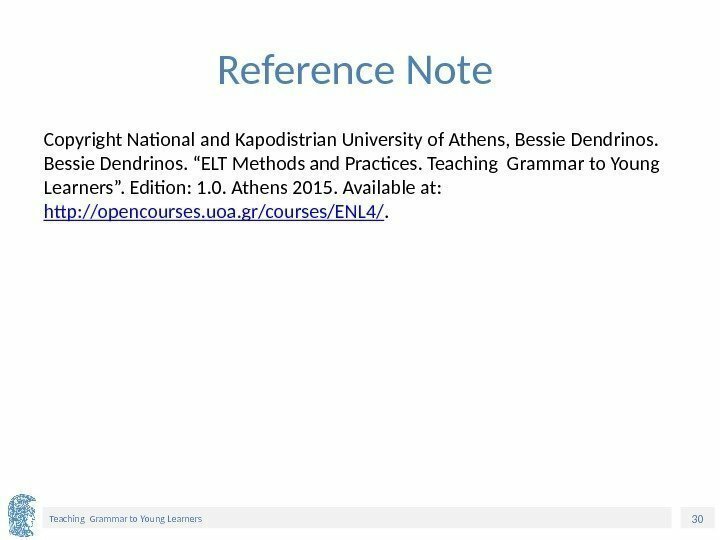 30 Teaching Grammar to Young Learners Reference Note Copyright National and Kapodistrian University of Athens, Bessie Dendrinos. “ELT Methods and Practices. Teaching Grammar to Young Learners”. Edition: 1. 0. Athens 2015. Available at: http: //opencourses. uoa. 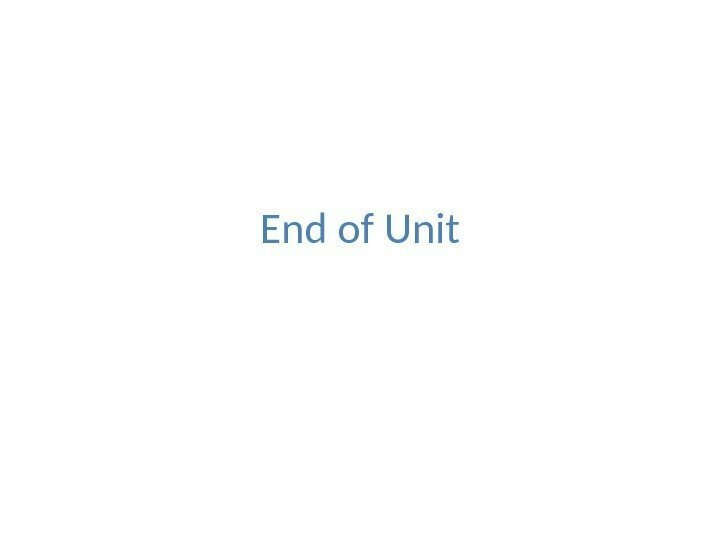 gr/courses/ENL 4/. 31 Teaching Grammar to Young Learners Licensing Note The current material is available under the Creative Commons Attribution-Non. Commercial-Share. Alike 4. 0 International license or later International Edition. The individual works of third parties are excluded, e. g. photographs, diagrams etc. 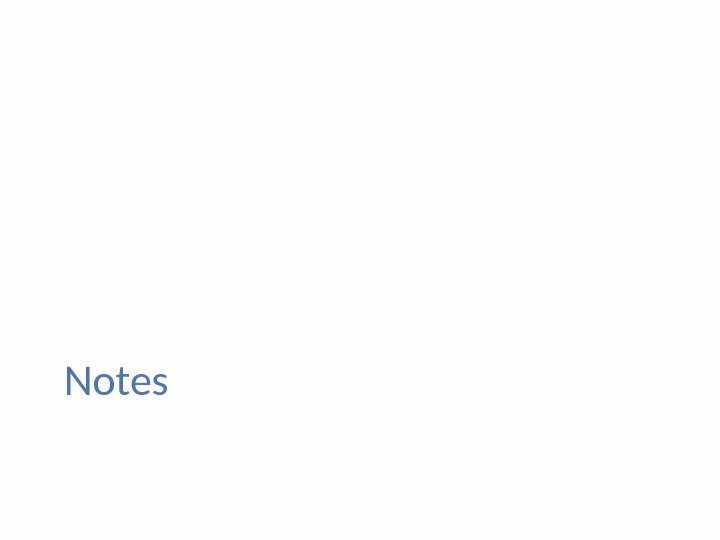 They are contained therein and covered under their conditions of use in the section «Use of Third Parties Work Note» . http: //creativecommons. org/licenses/by-nc-sa/4. 0/ As Non-Commercial is defined the use that: • Does not involve direct or indirect financial benefits from the use of the work for the distributor of the work and the license holder. • Does not include financial transaction as a condition for the use or access to the work. • Does not confer to the distributor and license holder of the work indirect financial benefit (e. g. advertisements) from the viewing of the work on website . 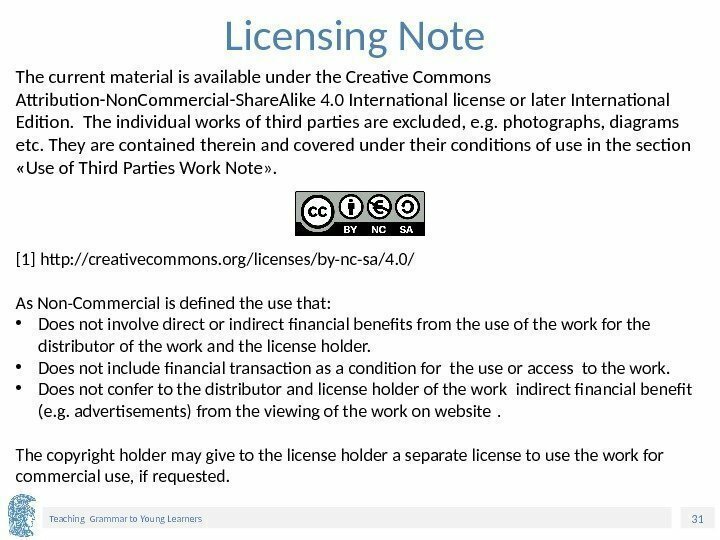 The copyright holder may give to the license holder a separate license to use the work for commercial use, if requested. 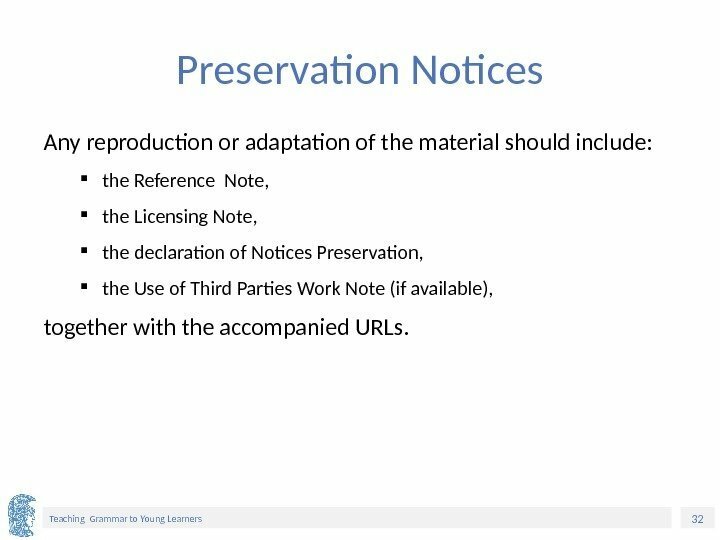 32 Teaching Grammar to Young Learners Preservation Notices Any reproduction or adaptation of the material should include: the Reference Note, the Licensing Note, the declaration of Notices Preservation, the Use of Third Parties Work Note (if available), together with the accompanied URLs.